Dr U.Ve MA Venkatakrishnan swami is wonderfully delivering Bhagavad Vishaya Kalakshepam. His style of delivery is lucid, excellent, simple but communicates well to convey complicated matters easily. His lectures are research oriented , transparent and thought provoking. On 25.8,2013 , MAV swami completed 6th ten ‘Ulagamunda peruvaayaa’ sathumurai at Periya Jeeyar mutt, Thirumala. The new edition of Vainava Acharyargalin Vazhvum Vakkum Book was also released by HH Srimat Paramahansethyadi Thirumalai Periya Kelvi Jeeyar Svami and HH Srimat Paramahansethyadi Thirumalai Siriya Kelvi Jeeyar Svami. 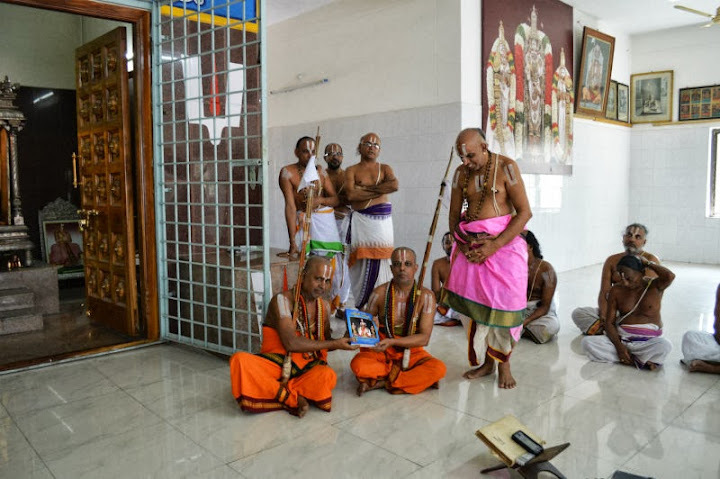 Devotees are encouraged to listen to the kalakshepams and obtain the new edition of the invaluable book – Vainava Acharyargalin Vazhvum Vakkum. When is the Kankulum pagalum thiruvaimozhi sattrumurai at Srirangam? (Place, date and time).